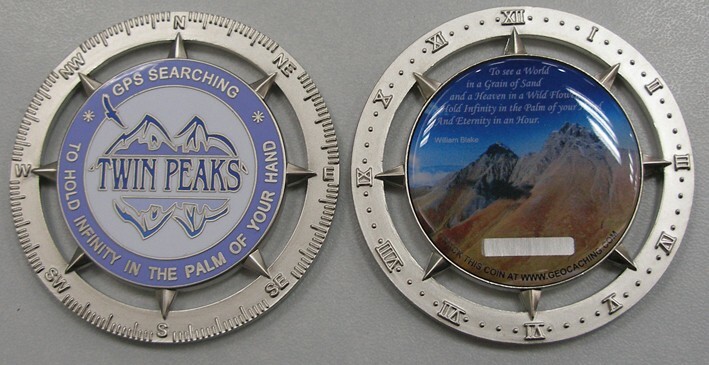 Hi, we are Twin Peaks from Holland and we decided to make a personal geocoin. More info at the ordering site. PLEASE, do not e-mail me with trading requests. If some are left after sale, I will be on the lookout for trades. Sales are starting with the publication of this forumpost! Will you be trading any of these? Thanks! Very interesting coin. Order sent (3/1). Request sent, great looking coin! Very nice. Email sent. Thanks. If anyone is ordering several, I'd like to trade for this coin. Too expensive to order just one. Thanks! Order sent for 1 of each. Thanx for the opportunity. At this moment the coin is selling better in Europe (70 / 30) , so tonight I intend to adjust the numbers. Only 32 LE coins left!! OKay, between the coin owner and my buddy Bert, I think I am covered. Thanks! We have decided to lift the Limit for the regular coins to 6 coins. 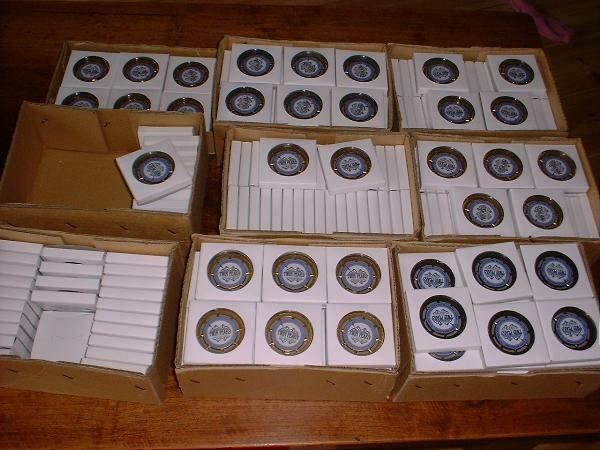 Turned out we are selling too much LE coins compared to the Regulars. All of you that have already ordered and want more regulars can use the same orderpage again. I wil combine the orders. There are still about 20 LE Gold available, so hurry, if you want some. Request sent for one of each ! NICE LOOKING COIN ! I had a number of coins reserved for "Europe"
and a number of coins for "outside Europe"
also a limitation on the number of coins per order. The sale has been going on for two days now. In my opinion, everybody has had a fair chance to order our coin. So from this moment on ordering is no longer restricted. Anyone can order as many as they like. If you have already ordered and want more? Feel free to order again, I will combine the two, into 1 order. Well, I had ordered this one, but got the e-mail about the payment, and found out that I was expected to pay extra to cover the paypal fee! I've bought quite a few coins lately, but that is a first. I want to add that it is a beautiful coin, and the actual price of the coin is fair. The extra fee just put it out of my reach because of the cost of international shipping. Hi everybody, I am sorry for the upset. I have no commercial experience whatsoever, so I did not calculate the fees into the price of the coin. Why? because I did not think that would be fair to all those who are paying me by bank. They would be paying extra for something they don't use or get. It is a complcated coin, quite expensive to have made, and I have kept the price of the coin as low as possible, for everyone, making no difference between European buyers or worldwide buyers. Compared to other coins on sale, this is a bargain, and I am affraid I will loose money on it. I have no problem with that, because it was a great project for me to do, which, I hope added something to the Geocaching community. I have offered MustangJoni not to pay the fees, but he/she chose to cancel. In Europe paying by bank is free, so that is why there are two options. and that is why I did not calculate it in. Maybe I should have made that clearer in the order form. My mistake, and I will pay for it. I may just loose just a little more money, but it was still great fun to make the coin! I sent you a reply to cancel my order. Sorry, it's a nice coin and all but I just try to trade for one somehow. I had a nice e-mail conversation with Twin Peaks. He is a very reasonable person. He did tell me that if I didn't want to pay they fee, I could still get my coin, but I did not feel that would be fair to him or others who were paying it. Also, I'm sure many people will want this coin. I think we have agreed to disagree on the paypal point. My point is that credit card companies charge sellers to be able to accept a card. They mark their prices up to accomodate that. If I pay cash, I still have to pay the same price as someone who used a card. His point is also very valid. It is a small fee, on a reasonably priced coin. And I'm guessing (I don't know) that a lot of people pay through the bank in Europe? It is a beautiful coin, but with international shipping is just too high for me, as I have vowed never to pay over $14 for a coin with shipping and all costs. It is a beautiful coin! If I pay cash, I still have to pay the same price as someone who used a card. you say it yourself: "If I pay cash, I still have to pay the same price as someone who used a card." and that is exactly my point: I did not want those who pay me by bank, paying for PayPal services they do not use! thus I did not calculate it in. Your guess is right MustangJoni, all of my customers in Europe (which is 65% of all my customers) have payed through te bank, and they charge no fees. PayPal maybe in use worldwide, but it is based upon what appears to be "common use" in the USA. It is not common in Europe. But you are right on the other points as well, I should have told people beforehand, and I take the blame. I have learned a lesson here. As I said before: you do not have to pay the Paypal fees. It was my mistake and I will bear the consequences. On all the invoices going out today I have removed the part about the PayPal fees. All those who have already paid it, will have the PayPal fees refunded. It was my mistake, I will take the loss. It may take a day or so to sort out who have and who have not paid the fees, but you will be refunded. We received a cancellation on 2 LE's and we have dug up a few extra LE's from our reserve. We now have an extra 8 LE's on sale and we still have 15 regulars. They are from a fellow cacher (Psychochicken) but I had promised a few of you who spotted this one on the site where I also sold my coin, to notify them, when this one was going to sell. These are also reasonably priced. I think they turned out quite nice! we just have to be patient a little more, but I think the coins are worth the wait! Very Nice! Can't wait to get mine. 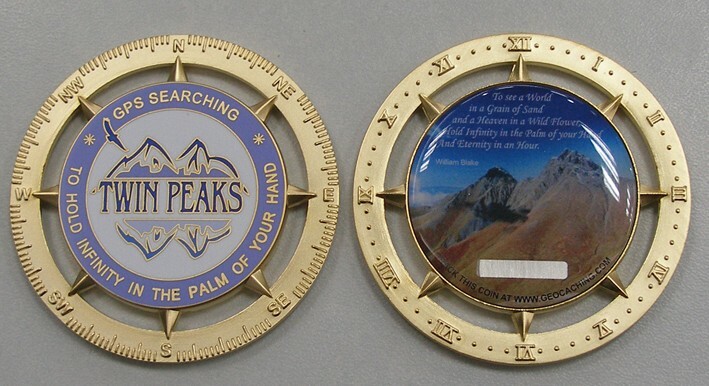 Today I received an email from the manufacturer: the coin will be ready around 17th of May. Everyone who ordered and paid for the coins, will get their coins a.s.a.p. Those who ordered and have not paid me yet: I will send the coins as soon as I received payment (please check). Those of you who have ordered, but not received an invoice yet: please email me at: sjvdberg@hetnet.nl from a working email-address. I have not been able to reach several people at their given email-addresses, emails have come back to me "undeliverable" so, if you ordered and still want the coin: please contact me! Reservations that have not been paid by 17th of May, will be cancelled. These coins will be sold again. What about those of us who traded? I have not received an invoice as yet. I've just sent an email to you as requested. For info the email is from my personal account. Really looking forward to receiving this coin! Got any updates? Won't be long now, but there is still a lot of work to be done!